TS EAMCET Mock Test 2019: Telangana EAMCET Free Online Practice Test 2019 For engineering and medical streams available at eamcet.tsche.ac.in. Telangana State Higher Education Council (TSCHE) is going to conduct the Telangana Engineering Agriculture Medicine Common Entrance Test (EAMCET-2019) examination for aspirants seeking admission into Engineering, Medicine, and Agriculture Graduate Degree courses. Many of the students seeking admission in Engineering, B.Tech, MBBS, B.Pharmacy and other courses are going to appear for the Telangana EAMCET examination annually. the Telangana State Council for Higher Education (TSCHE) has announced that the Telangana EAMCET will be held from 3rd May to 9th May. This year a large number of students are expected to appear for the TS EAMCET examination. Aspirants who are going to appear for the examination can check much details of TS EAMCET exam pattern, Mock Test, syllabus, old question papers and others from the TS EAMCET official website, tsche.ac.in. Telangana State Higher Education Council annually organizes various entrance examinations for students seeking admissions in Telangana Universities. The Telangana Engineering Medicine Agriculture Common Entrance Test (EAMCET) examination will be conducted for the aspirants seeking admission in Engineering, Medical graduate degree courses. Jawaharlal Nehru Technological University Hyderabad (JNTUH) is going to organize the EAMCET examination in the state. Tentatively, 1.5 lakh aspirants are going to appear for Telangana EAMCET examination this year. The EAMCET will be conducted from 2nd May to 7th May. Aspirants seeking admission in MBBS, Engineering, B.Pharmacy and other graduate degree courses appear for EAMCET examination. Students must have the minimum educational qualification of 12th class/Intermediate with MPC Or Bi.P.C are eligible to appear for the examination. The EAMCET examination will be conducted for 160 questions in Mathematics, Physics, Chemistry subjects for Engineering and Agriculture streams and Physics, Chemistry, and Biology subjects for Medical stream. Students appearing for the EAMCET examination must have the good knowledge about the TS EAMCET syllabus before going to appear for the test. Aspirants appearing for TS EAMCET examination can practice mock tests. Mock tests are going to give a complete idea regarding the examination. The EAMCET examination will be held for 3 hours. Candidates appearing for the TS EAMCET examination must keenly aware of syllabus and examination pattern, so that, it will be less complicated to clear the test. Aspirants who are going to appear for the TS EAMCET 2018, can initially, appear for the mock tests. So that, the clear practice of the examination will be done. The mock test is conducted for a duration of 3 hours with 160, questions, same as the actual examination. After taking up the test, students can analyze their attempt. Also, by practicing mock tests, students can improve their speed of attempt and can improve the skills to attempt the TS EAMCET examination in a better way. Ultimately, students can get a good grip on examination pattern, and analysis skills. And it will be useful to get the best rank in the examination. Students who have applied for TS EAMCET ca check more guidelines, how to take EAMCET mock test and other details from here. 1. Total duration of examination is 180 minutes. The Marked for Review status for a question simply indicates that you would like to look at that question again. If a question is answered and Marked for Review, your answer for that question will be considered in the evaluation. 4. Click on the “>” arrow button to maximize the question window. To view the question palette again, you can click on “<” which appears on the right side of question window. b. Click on Save &Next to save your answer for the current question and then go to the next question. a. To answer a question, Click on the button against the chosen option among the given four options. e. To mark the question for review, click on the Mark for Review & Next button. If an answer is selected for a question that is Marked for Review, that answer will be considered in the evaluation. 7. To change your answer to a question that has already been answered, first select that question for answering and then follow step 6(b) above. 8. Note that ONLY Questions for which answers are saved or marked for review after answering will be considered for evaluation. 9. Sections in this question paper are displayed on the top bar of the screen. Questions in a section can be viewed by clicking on the section name. The section you are currently viewing is highlighted. 10. After clicking the Save & Next button on the last question for a section, you will automatically be taken to the first question of the next section. 12. Candidate can view the corresponding section summary as part of the legend that appears in every section above the question palette. 2. You will be given 180 minutes to attempt 160 questions in Mock Test. 3. There are no negative marks. 4. Questions will be available in two languages – English and Telugu. 5. The questions will be displayed on the screen one at a time in both the languages. 6. Each question will have 4 options, out of which one will be the correct answer and the candidate has to select one option. How To Write Telangana TS EAMCET 2019 Mock Test Online? 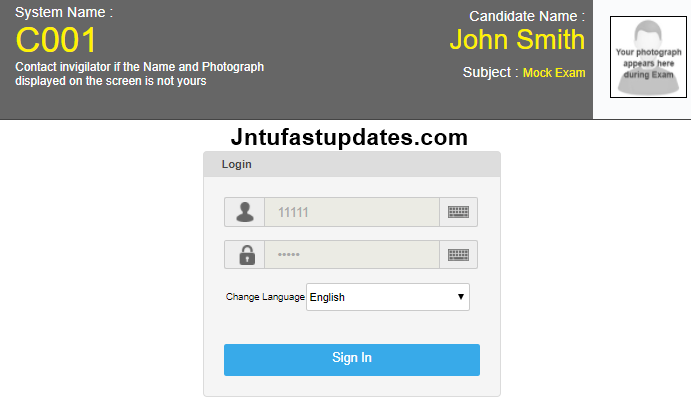 No need to Fill any login details, You can directly click on the Sign in button. Read the Instructions and Click On NEXT Button. Check Other Important Instructions, Keep tick mark in Terms and Conditions Box and Click on Ready to begin. Next screen, You will get question and answers. If you try more times, you will get more practiced. 1.3 How To Write Telangana TS EAMCET 2019 Mock Test Online? how to know the marks i have scored ???? How can I get result of mock test????? How to check result of mock test?? how to I get the result of the mock test conducted by u???????????? how do i get the marks of my attempted mock test???????? ?